Are you wondering what year did Dodge start using DPF? If you are familiar with Dodge vehicles, you have probably heard of DPFs. DPF stands for diesel particulate filter and Dodge has been installing them on their diesel vehicles for a while. A diesel particulate filter’s function is to remove DPM (diesel particulate matter) from the exhaust of a diesel engine. This process is important to prevent harmful particles from entering the open air. You may recognize DPF as being similar to DEF (diesel exhaust fluid), which is another way of reducing or eliminating harmful emissions during the fuel burning process. Though you may have heard of these pollution reduction methods, you probably don’t know why and when they were implemented into Dodge vehicles. Knowing this background information is important to understanding diesel vehicles and the effect that they have on our environment. As the EPA and other organizations learn more about engines and how they affect our environment, the regulations on emissions from diesel vehicles have increased in frequencies and the number of restrictions contained within. In response, auto manufacturers started making vehicles with those new regulations in mind. 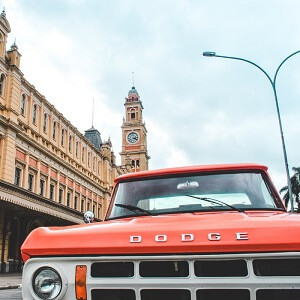 For Dodge vehicles, this meant implementing a DPF to stop particulate from the fuel-burning process from entering the air and contributing to the pollution of our air. Before these regulations, DPFs were in use in large diesel vehicles. Since there were no regulations in the 1980s on medium and small diesel vehicles, there was no need to include them in those vehicles until they were introduced in the 2000s. Particulate filters were first used on automobiles in 1985 to comply with regulations on heavy trucks. As discussed earlier, DPF stands for diesel particulate filter. Though different filters eliminate particulate in different ways, the mission is the same for all: reduce emissions created by the burning of fuel in diesel engines. These emissions and particles are often harmful and have been proven to be bad for our environment. The idea of DPFs have been around for decades, but did not gain widespread use until new emissions regulations became imminent. At this point, auto manufacturers were forced to implement a solution to meet the guidelines outlined by the government. DPFs are mostly temporary in vehicles, and they need to be maintained and replaced as with any part on your vehicle. In many cases, if there is an issue with your DPF, your dashboard will display a DPF light indicating that it needs attention. Often, you only need to operate the vehicle above 40 mph to activate the burning process that eliminates the waste. If that doesn’t work, you may need to completely replace the filter. What Year Did Dodge Start Using DPF? Dodge began manufacturing vehicles with DPF in 2007 in anticipation of the passing of strict regulations by the EPA. The regulations that were applicable to Dodge vehicles began in 2008 in the state of California and soon spread to the entire country. To prepare, Dodge started making their vehicles compliant ahead of time. DPFs were a necessary measure put in place by Dodge to meet regulation guidelines, but consumers have been less enthusiastic about the part. Often, drivers will ignore their DPF when it needs to be replaced or remove it altogether. We don’t recommend this, as it could lead to far more problems than it’s worth. You could be subject to legal action including fines, and auto repair shops can also be held responsible. It’s best to correctly maintain your DPF and bring it in to a certified and experienced mechanic when it needs repair or maintenance that you can’t do yourself. DPF stands for diesel particulate filter and it’s a part commonly found on diesel vehicles. Its purpose is to prevent harmful emissions and particles from entering the air and damaging the environment. These harmful emissions have come under intense scrutiny in recent years with the increased concern over the quality of our air. DPFs are one of the solutions that auto manufacturers, including Dodge, have deployed in order to be compliant with emissions regulations put in place from 2008-2010. Though DPFs have been around since 1985 on automobiles, they only recently became an important part for consumers to be concerned with since prior to then, they were only in use on large diesel vehicles like semi and box trucks. Dodge first started using diesel particulate filters in 2007 and continue to use them today.